The aorta is the main artery that carries oxygen-rich blood from the left ventricle (lower left heart chamber) to the rest of the body. 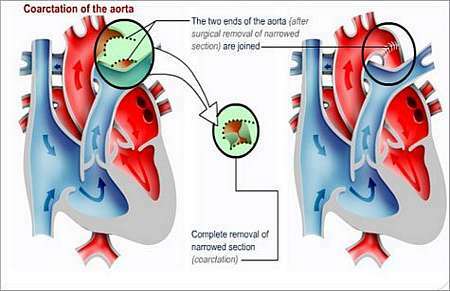 Coarctation of the aorta means that an area of the aorta is abnormally narrowed. 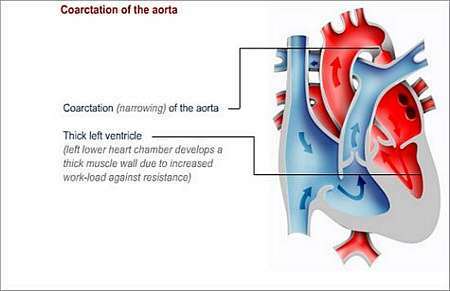 When this condition occurs in babies, the affected section of the aorta may be so narrow that it causes significant obstruction to blood flow. In these patients, narrowing of the aorta is present at birth, but it may only become more of a problem as the child gets older. Arteries that carry blood to various parts of the body branch off from the aorta. In children with coarctation, those arteries that branch off before the narrow point, receive more blood than arteries that branch off after it. This results in increased blood pressure in arteries that supply blood to the arms and head sections and it reduces blood-flow to the legs. The net effect is that the heart is forced to work harder and that it consequently enlarges. Over time the extra load on the heart causes heart failure. In most instances, symptoms do not appear until approximately one week after birth. 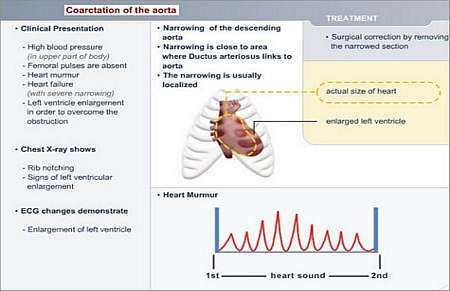 In newborn babies, the narrowed section of the aorta may not be diagnosed until the ductus arteriosus (temporary blood vessel that formed part of foetal circulation) closes a few days after birth. In some cases, the narrowing may appear in association with other conditions such as valve problems and septal defects. The left side of the heart (the left ventricle) has to pump at a much higher pressure to force the blood through the narrowed artery and eventually develops heart failure trying to do this. When this occurs in babies, symptoms include shortness of breath, inability to feed and they eventually appear pale and shocked. Urgent hospital admission becomes necessary, usually during the first weeks of life. In other cases, the coarctation may not be diagnosed until the child is older or even a teenager. Older children mostly do not have any overt symptoms. They present with leg cramps and tire easily when physically active. In most cases the condition is diagnosed because of a heart murmur and high blood pressure in the arms, with weak leg pulses. It is important that the diagnosis of this condition be made at the earliest possible time in the life of a baby. The longer the condition goes untreated, the more likely the child will suffer from high blood pressure throughout his or her life. Initially, the clinical picture will alert the clinician to contemplate further physical examination and special investigations. Echocardiogram (ultrasound scan) will confirm the diagnosis (show a narrowing in the aorta). Cardiac catheterisation (in cases where the patient presents with other heart defects as well). Treatment is usually required urgently in neonates (newborn babies). Older children can be treated electively depending on their symptoms. The child will need to have either surgery or balloon dilatation. Surgery will be recommended in most cases and certainly in the neonatal/early infancy period. An incision is made in the left side of the chest. It involves removing the narrowed part of the aorta. The narrowed part is cut out and the two ends of the aorta joined together (if the narrowed part is small), otherwise a tube of fabric or a flap of tissue may be used to connect the two ends). If the ductus arteriosus is still open, it is closed off. The operation is carried out without having to use a heart-lung machine. In order to widen the narrowed segment without surgery, the doctors may use a catheterisation procedure called balloon angioplasty. This technique is especially favoured in re-coarctation. A catheter (a fine, hollow tube) with a balloon at its tip is introduced through the artery in the groin. From there it is guided through this artery up to the narrow part of the aorta. On reaching the narrowed part the balloon is gently inflated to stretch the narrowing. Thereafter, the deflated balloon and catheter are removed. A child who has had a balloon dilatation will usually have to stay over in hospital for one or two nights. More recently, doctors have been using wire-mesh devices called stents to support the aorta and keep it open. These stents are implanted during an angioplasty procedure. If the aorta becomes narrow again later, after surgery or balloon dilatation, the child may need to have another balloon dilatation several months or years later. The child will need regular outpatient check-ups; quite often at first and then less often as the child gets older and his or her condition improves. Livelong surveillance, on an annual basis, is recommended to treat and identify secondary effects of the coarctation, which may include early coronary artery disease, hypertension or treatment of associated defects such as an abnormal aorta valve. Some children may also present with other heart problems. 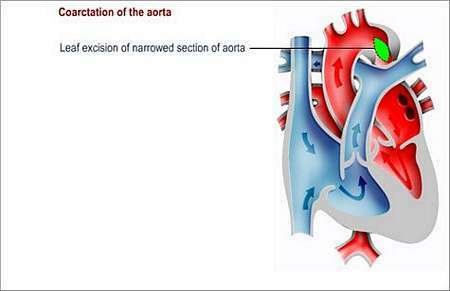 The most common conditions associated with coarctation of the aorta include ventricular septal defect and aortic stenosis. Children who have these conditions in addition to coarctation, will take longer to recover from the coarctation operation. It is important to prevent endocarditis in children with coarctation or a residual pressure gradient of the aorta. (Endocarditis is an infection of the lining of the heart or heart valves). After correction of the defect, the doctor will advise as to the need to continue antibiotic prophylaxis. The child should wear a Medic Alert card/bracelet stating the need for antibiotics before certain forms of surgery or dentistry.